Oil’s set for its longest stretch of declines on record after entering a bear market, with investors awaiting a weekend meeting of OPEC and its allies to discuss output strategy. Futures in New York are slipping for a 10th day, extending a dramatic plunge that’s dragged prices down over 20% from a 2014-high just five weeks ago. The slump has rattled producers, and the Organization of Petroleum Exporting Countries has signaled it may cut output next year - an option that’ll be part of talks when the group meets with partners in Abu Dhabi on Sunday. Oil’s slump has been exacerbated by a US decision to allow eight countries to continue importing from Iran even after it hits the OPEC member with sanctions. That revived concerns of a supply glut, in contrast to earlier fears over a crude crunch due to shrinking exports from the Persian Gulf state. Pledges by other producers such as Saudi Arabia to pump more and record American supply as well as rising stockpiles also weighed on prices. 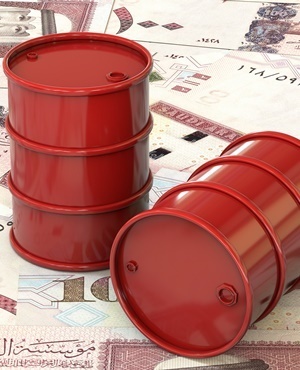 “Certainly, the waivers on US sanctions for Iranian crude have really accelerated the decline from last month and sensitivity to those issues have been high in recent times,” said Daniel Hynes, a Sydney-based senior strategist at Australia & New Zealand Banking. West Texas Intermediate for December delivery traded 6 cents lower at $60.61 a barrel on the New York Mercantile Exchange at 3:20 pm in Singapore. The contract fell 1.6% to $60.67 on Thursday, and is headed for a 4% decline on the week - its fifth consecutive decrease. Total volume traded was 35% above the 100-day average. Brent futures for January settlement edged up 9 cents to $70.74 a barrel on the London-based ICE Futures Europe exchange. Prices are also on course for a fifth weekly drop, down 2.9%. The global benchmark crude traded at a $9.93 premium to WTI for the same month. A potential decision to return to output cuts by OPEC would mark the second production U-turn this year for the group, some members of which are said to be concerned that inventories are rising. For Saudi Arabia - the world’s biggest crude exporter - a reduction would mark the third time in recent years the kingdom has delivered a supply surge only to quickly reverse it. In the US, crude production increased to 11.6 million barrels per day last week, the highest level on record, according to Energy Information Administration data. At the same time, nationwide stockpiles rose 5.8 million barrels last week, compared to a 2-million-barrel gain expected in a Bloomberg survey. Meanwhile, OPEC’s production in October reached the highest level since 2016, and Russia hiked its output last month to a post-Soviet record of 11.4 million barrels a day. When they meet this weekend, the producers will have to contend with not only the threat of a glut, but also the risk to demand from faltering emerging-market economies and a trade war between the US and China. • TransCanada’s long-troubled Keystone XL oil pipeline project hit another roadblock as a US District Court in Montana ruled it must wait for a further environmental review. • A Saudi think tank is studying what happens to oil markets in a world without OPEC. It’s the second in a series, after an earlier report found that the group’s spare capacity reduces oil price volatility and generates as much as $200bnn of annual economic benefits for the world economy. • A collision between an oil tanker and a military frigate off Norway’s coast temporarily shut down the nation’s largest crude-export terminal, halted the pumping of several North Sea grades, and boosted immediate natural gas prices in the UK.